The other day, we ate at Whole Foods. I love the selections in their salad bar. So many items are actually organic now. Anyway, I had this delicious Brussel sprouts salad. So I took a picture of the ingredients and tried to re-create a similar dish at home. My Brussel sprout salad is slightly different. It is also very tasty! Now that the weather is warming up, this Brussel sprouts salad would be perfect to take to a spring party. Or you could make it for Easter as well. I have only recently become a fan of Brussel sprouts. If you are on the fence about them, I highly advise you to try my Maple Glazed Brussel Sprouts or my Honey Balsamic Brussel Sprouts. 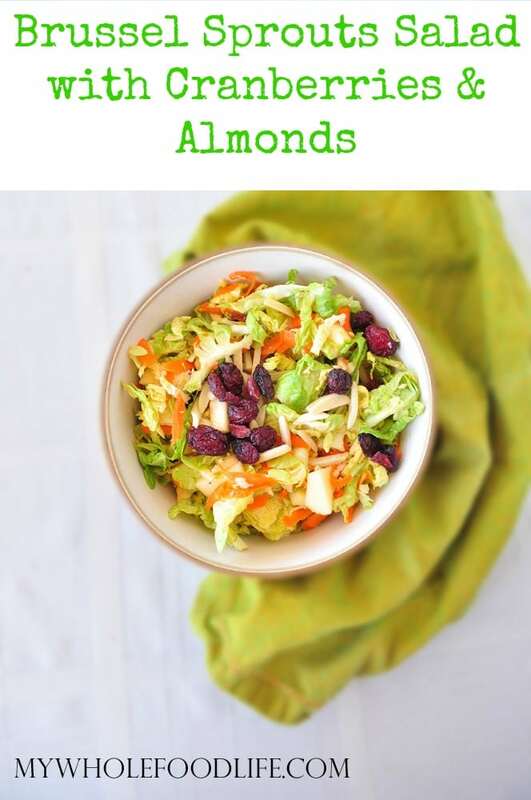 A light and healthy salad perfect for spring! In a small bowl, whisk all the dressing ingredients together. I highly suggest letting the salad sit in the fridge for 30 minutes or so. That will give the flavors time to marinate. This salad should keep for a week in the fridge. Enjoy! What is the easiest way to shred brussellsprouts? Would it work at all in a food processor? You can shred them using a cheese grater on the largest setting. Or you could sliced them thin sideways. That is what I did. Do you think that this would work with broccoli? I've been wanting to make a raw salad with it and this sounds really good. Love this!!! I just bought more dried cranberries this morning! Do you think I could use pomegranate seeds instead of the cranberries? I have cranberries but also have pomegranate seeds I need to use. Yum! Yes that would be good too.